If you share your Apple device running iOS 7, you want to make sure web browsing history is kept as private. Here’s how to enable Safari’s Private Browsing. If you share your iPhone or iPad running iOS 7, you might want to make sure your browsing history is kept as private as possible. 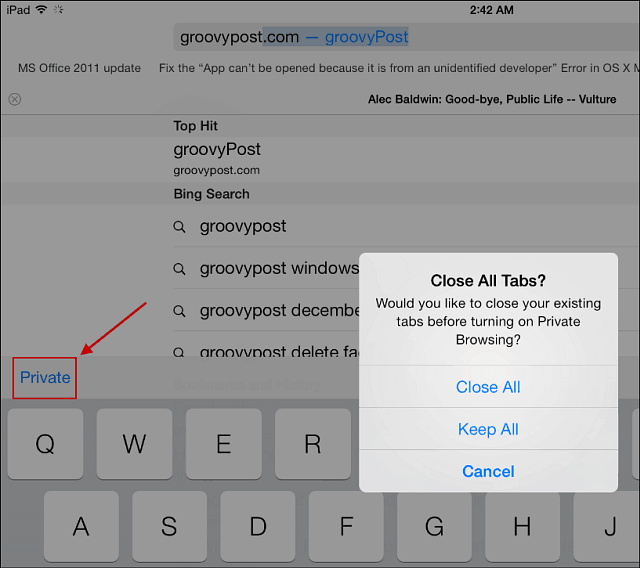 One way to do that is enable Private Browsing when you use Safari. The Private Browsing feature has been included in previous version of iOS and is a good way to keep others from seeing or using your history in the browser. With it enabled, Safari will not keep track of visited pages, search history, AutoFill information, and it blocks sites from tracking your browsing behavior. To use Private Browsing, on an iPad, launch Safari and tap the address bar. The onscreen keyboard will come up and you just need to tap Private on the upper left corner of the keyboard. If you have tabs already open, a message will come up asking if you want to close them. You’ll know that Private browsing is enabled as Safari will change its color to black around its borders. On the iPhone, launch Safari and tap the Show Pages icon at the lower right corner, then tap Private. This is just one important feature to enable is you want to keep your shared iOS 7 device private and secure. For more, check out these five tips on iOS 7 privacy and security. 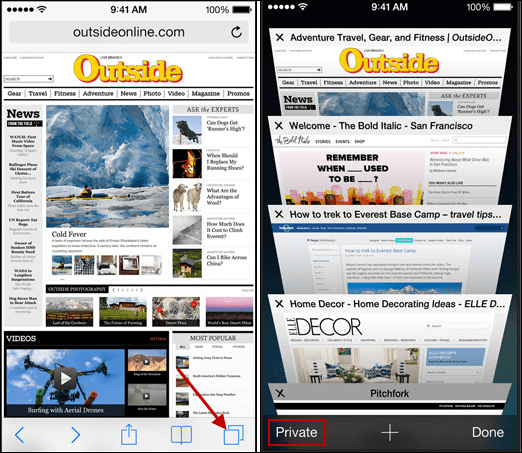 If you’re still using iOS 6 or older, check out our article on how to enable Private Browsing in Safari on previous iOS versions.